At StoryPoint, we design our communities to include everything you need for the best parts of your life. Come For The Cooking. Stay For The Conversations. Local community farm partnerships provide you with the freshest ingredients available. Monthly food feedback forums to ensure we’re meeting all of your expectations. Executive Chef or Sous Chef available in the dining room every evening. Monthly cooking demos where you can learn how to replicate your favorite community dish. Your Executive Chef will demonstrate a mix of your favorites along with some exciting new dishes to try. Registered Dietitians review menus for nutritional standards. Daily rotating meals, including favorites and new expressions. Growing Older Is Inevitable. Sitting Around Doesn’t Have To Be. At StoryPoint, our communities are places where everyone can pursue their passions, day and night. Every month has a full calendar of activities designed to nourish the body and mind. When you’re looking to go out, you can enjoy shopping outings, art and culture experiences and trips to live events. Closer to home, you’ll find physical fitness programs, walking paths, social clubs and even happy hours! Whether you stay in or go out, there’s no better place to have fun. Our social programs are fun and interesting opportunities to interact with each other. They can be happy hours, club meetings, group fitness activities and more! Intellectual programs challenge and stimulate your mind. We encourage you to continue your quest for knowledge and achieve your learning goals with our Intellectual Programs. We don't focus on what you cannot do, but rather what you can. We make modifications based on your abilities and mobility. Our spiritual activities go beyond church services and bible studies, including journaling, meditating and volunteering! A Place Where Everything Is Designed To Brighten Your Life. The first thing you’ll notice at a StoryPoint community is how welcoming it feels. The minute you walk through the door, the energy of happy residents shows you what a lively and dynamic place it is to live. We designed our community as a place where seniors can live better than they could anywhere else. We are humbled by these kind words and honored to serve our residents every day. Our Mission Is To Make You Feel Happy, Healthy And, If Necessary, Hugged. 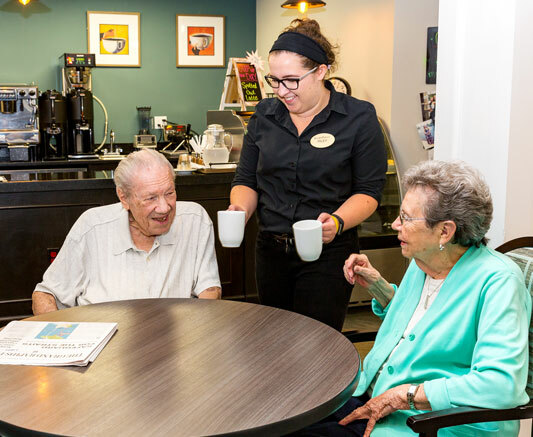 Everyone at StoryPoint has the same job – to create meaningful connections with our residents and their families. 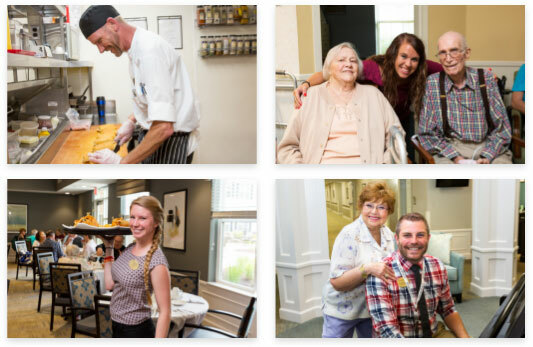 Our employees put residents first and are dedicated to keeping everyone genuinely happy. We take great care in finding the best employees, and we think you’ll notice how big of a difference that makes. Our model is different. We are the only ones in the industry that have created an environment where our Executive Directors can exclusively focus on our residents’ and families’ wants and needs. They do not have any direct reports, they’re not responsible for hiring employees, they never have to work on financials, or any administrative functions. They exclusively love and care for you. We have eliminated all other responsibilities to ensure they spend every day making you feel safe, comfortable, happy and supported.